The 4th in the series is releasing here ahead of its American opening. After the most persistent squirrel in the world manages to split the continents apart trying to retrieve his acorn, the friends find themselves adrift on an iceberg. They bump into a pirate who promptly takes them captive, and need to work together with some new friends to escape. In between, there is romance and other minor plotlines to fill out the action. 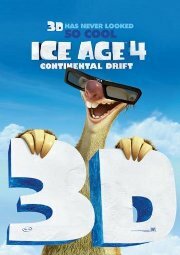 This film is releasing in both 2D and 3D, this is the 3D version.